Formula One boss Bernie Ecclestone is part of a bid to buy struggling Swedish carmaker Saab. Mr Ecclestone has joined forces with Luxembourg-based private investment company Genii Capital, which recently invested in Renault's F1 team. Loss-making Saab has been put up for sale by its current owner, US giant General Motors (GM). A second offer for Saab has also emerged from the Dutch sports carmaker Spyker. Swedish newspaper Dagens Industri has also reported that GM has received a third bid from a Swedish consortium. This group is said to include Haakon Samuelsson, a former executive with lorry firms MAN and Scania, and Jan Nygren, a former politician and one-time executive with the Saab aerospace company. Mr Ecclestone told the Bloomberg news agency: "[Saab] is a good brand that has probably been neglected by the current owners." There are three bids on the table, yet the future looks as uncertain as ever for Saab's 3,400 workers. F1 boss Bernie Ecclestone's involvement suggests there is still value in the brand, but that is not to say any of the prospective buyers would retain the whole workforce. There is little technology left in Trollhaettan that is owned outright by Saab itself. Saab engine, gearbox and tooling technology was recently sold to Beijing Automotive. Hence, any buyer would need to strike a technology-sharing deal with GM to keep the Swedish operation going. And Saab under new ownership would almost certainly be a low-volume carmaker. "We don't own it yet, so let's see what happens," he added. Genii said that it would "aggressively work towards a successful closing of the transaction with all the relevant stakeholders of the company". It added that Saab has "tremendous brand value in a number of key automotive markets, as well as an innovative image". Spyker's bid for Saab is its second, having previously made an unsuccessful approach on 20 December, two days after GM said it would close down the Swedish company if no suitable sale could be agreed. Victor Muller, the chief executive of Spyker, said: "We believe the Saab brand has lots of potential and would be keen to close a deal as quickly as possible." Mr Muller, whose company has a workforce of only 133 people, added that he was continuing to have a "constructive dialogue" with GM bosses. No details have been revealed about how much either Spyker or Genii and Mr Ecclestone are offering for Saab. GM has been trying to sell Saab since January last year. In June, GM announced that it had agreed to sell it to sports carmaker Koenigsegg, only for the Swedish company to pull out of the deal in November. 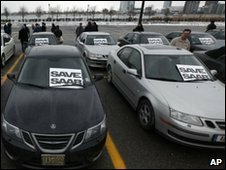 Saab, which employs 3,400 people in Sweden, lost 3bn kronor (£255m; $412m) in 2008, and it has not made a profit since 2001. A meeting of Saab board members will take place on Friday. The company is due to resume production on 11 January following a four-week shutdown for the Christmas and new year period.